What If Money Printing & Additional Supply Caused Bond Prices To Fall? 1. Commodities make up a much lower percentage of the average citizen's balance sheet (usually 0%), while the big three (stocks, bonds, real estate) make up the majority. Individuals feel the "wealth effect" of rising financial assets which makes them more likely to consume more and stimulate the economy. 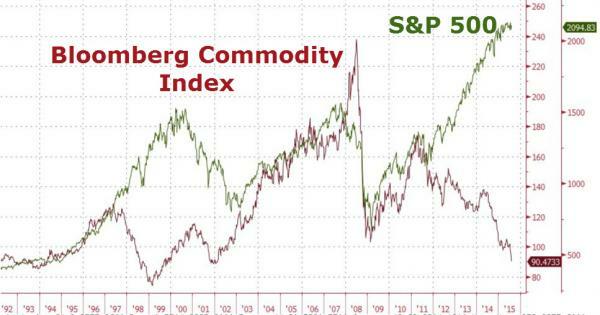 2. Commodities are the initial input price that makes up the cost of living (energy, food, clothing, etc.). Lower commodity prices provide individuals with additional money every month to spend or invest. They also lower the cost side of corporate balance sheets which pushes profits higher. Asset prices rising (good inflation) and commodities falling (good deflation) create a nirvana for the financial markets and the economy. That is exactly what we have experienced since mid 2011. Central banks have lived in a fantasy world since since 2011 where additional money printing has lowered bond yields, pushed up stock and real estate prices and pushed down commodity prices. This is why central banks are widely considered godlike creatures today. Their every movement, spoken word, or action is followed, studied and worshiped. Over the last 35 years stocks, bonds and real estate have taken turns being the darling asset within investor's portfolio. I believe there will be a time at some point this decade when cash is the most coveted asset in the world. Many believe cash was the most valuable asset during 2008 when stocks and real estate were crumbling simultaneously, but what most forget is long dated U.S. treasury bonds rose by 27.1% that year and 22.5% in the fourth quarter alone! People did not collectively rush to cash, they rushed to the safety of the U.S. government. "During bubbles, it seems that the psychological ambiance is rather one of public inattention to the thought prices could fall, rather than firm belief that they can never fall." While some people are (correctly) talking about a bond bubble; investors don't care. Holding 40%, 60%, 80% or more of your portfolio in government bonds is considered prudent asset management at a time when yields are sitting at all time record lows (bonds are prices higher and more dangerous than any point in history). The coming decline in government bonds will be important for many reasons. Investors collectively believe if the economy slows down or the stock market falls, central banks will enter the market to "ease" monetary policy, which in today's 0% interest world means additional QE. But how does that process look in a world where bonds are in a secular bear market? What if adding to the money supply made investors question the quality of the underlying currency of that bond market? What if adding additional government debt (adding to the supply of bonds) made investors question the price of the bonds they held? This will only occur when investors see bonds can lose principal, something that has not occurred on their 401k or balance sheet since 1982. What's even more insane is there is no actual limit to the amount of bonds that can be issued. At least with real estate, bitcoins, tulip bulbs, etc. there are some actual supply constraints. In the bond (and stock) market, governments or corporations can create an unlimited amount of additional supply with a simple keystroke. What if the next downturn is triggered by falling bond prices and the central bank and government responses (additional debt and printed currency) only push those bond prices down further, thus creating a reinforcing downturn in stocks and real estate which are currently artificially supported by artificially low interest rates? That last paragraph is so terrifying to most people they just say "that can never happen." Not only can it happen, it is the most likely scenario based on the current levels of global debt and price of financial assets (stocks, bonds and real estate) that reflect the belief debt and money printing only bring economic panacea with no consequences. When people ask, "what is the end game?" That's it. There will be generational opportunities to buy assets on sale during the coming panic and chaos.